I just finished putting together my P-51 ( not from FT, sadly ) and want to know what are some good signs for a plane that will fly well. The electronics have yet to be installed and right now I just throw it around with the battery in it. It will not glide in any elevator position and I'm beginning to worry. The last plane I scratch built did not work and I'm beginning to suspect that this one will do the same thing. I don't have much RC plane experience and am desperate to get a scratch build in the air. When it is thrown, the plane will either flip up or down. I'm thinking it may be a CG or airfoil problem. Any and all suggestions are welcome. If you would like more information on my background or my plane, feel free to ask. Thank you. First thing, stay away from the P-51's as your first plane. Way to difficult to fly. Save that for when you've got a little experience. It may take you a few scratch built planes to succeed. It did for me. I didn't even get my first tiny trainer to fly. keep cutting foam and making cheap trainers until you can fly them, then move on to the warbirds. As for good signs, if you have it balanced on the CG and it glides well, then it has a good chance. Also the lighter the better. You really won't know for sure until you fly it though. You likely have a CG problem. The testing needs to be done with a neutral elevator, not up or down but level with the tail stabilizer. If it dives move the CG back, if it climbs CG forward. Check the documentation to see where the CG should be and start there. I agree with @jaredstrees the P-51 is not a good idea for a first plane. You would be far better off to start with a trainer. The Scorch, Bushwhacker, Simple Cup or Tiny Trainer would be far better choices as a first plane. You will crash your first plane many times, we all do. That's the beauty of foam board, WHEN you crash, just make a new one. What plans was it based on? If it wasn’t plan built you need to calculate where the CG should be on the wing and get that right first, with all the electronics and battery in situ. I am slightly concerned you are finished building without servos etc at least fitted, since most kits build around those unless they have access panels. An empty airframe won’t balance or glide at all well, everything is designed to require some nose weight at the least. Most kits designed for RC will be assumed to have RC fitted to balance. First establish where the CG is going to be, usually it’s near the wing main spar, soneone clever on here may have a way of working it out if you don’t know where it is. Get your electronics in, test them on the bench first WITHOUT A PROP ON THE MOTOR, get the servos centred etc. Then fit it, ensuring you have all the control surfaces as flat as possible at the middle position to minimise trim problems. Now CG the whole set up, be meticulous about that, just a touch nose heavy, no more than a few degrees off level. There’s a couple of good FT videos on pre flight checks and CG, watch them. Now you want to set the rates on the control surfaces, set up low rates first with a switch if you have them, then high rates. If you don’t know what your airframe rates should be then set to a similar FT gauge, print it off the plans. Set the low rates on your ailerons to under 50% total throw if you are learning, I found that much easier. You will want EXPO if your transmitter has it, 30% minimum on all three control surfaces, I set 50% expo on my ailerons as I am a clumsy pilot. Rates are important, they stop you having huge control surface movement when you are not ready for it. Make your test flights on low rates with expo on. If you have mixing on the TX put a little elevator on the ailerons, 10-20% as it helps keep the nose up. If your TX lacks expo then look at the FT stick limiters they made, they physically stop you throwing the sticks right over/up/down. Once it’s all CG tested and the rates are done, find a space with nice soft long grass/weeds to test glide it, throw it and see what happens. Do a RANGE TEST on your kit. DON’T TRY AND MAIDEN IN WINDS OVER 10mph. If all that works then try taxiing if you are going to ground launch, practice getting the tail up and see how it goes on the ground, dial in your undercarriage toe in so it tracks straight, you might have to compensate for the thrust angle of your motor with the rudder. If it’s a belly lander then you can skip that and try a flight, I did a few short hops in my tall weed test field first to see what trim and thrust angles I was going to have. When you first fly it for real, concentrate on going UP first, climb at least 60-100ft before trying to turn, if you have a buddy to hand launch get them to gently throw from the CG not too far forward/back and don’t launch at full throttle. If you don’t have a buddy launch with your left hand (mode 2 control) so you have elevator control. If you struggle to fly without total hands on sticks, stay really high to trim, then you have room to panic. Flying high is not a problem, get used to the handling a bit before trying to land, I found it better to sort the trim in flight and not try landing with it incorrectly trimmed, vs landing then messing with it, then trying again. If all this fails and you get a pile of smashed parts again, try a FT kit or set of plans, something a bit more forgiving like a Tiny Trainer, Sportster, Scout, Cub or similar. They are cheap and simple to build and all the complex work of sorting out handling and CG etc has all been done. It’s much easier to learn to fly first, then mess with personal designs, than the other way around. I have been building tons of other models for years and I found both kits and plans much easier to get help with as so many people had built them already. Hope this reduces crash time! With larger models it is often difficult for the newbie to throw the plane fast enough and straight enough for it to actually fly. Many times I have observed planes thrown that due to poor release the plane is thrown nose up, or down. The planes are also often thrown so that a turn is initiated upon release or even a roll. Here I use a bungee launcher and we get newbies to use it as well so that the launch is fast and without any adverse effects caused by poor release. Every now and then even an experienced pilot will have a bad throw, (well I still do), so I use the bungee for every glide test and maiden launch so that the plane is actually flying upon release. From there I can judge if I have balance or other issues. Due to the variability of the launch attitude that you describe I would seriously look at how fast you are launching it and the way you release. How about a picture of your model so we can see if your wing is on upside down or something? Also what is the size and weight of the air frame and what size battery are you using when 'throwing it around' but I have to agree a low wing 'war bird' type is far from ideal unless you have quite a bit of flying experience . Thank you all so much for taking the time to help. @Merv, what article would you suggest? @FDS, it was based on the actual P-51D. I took the 3 views and put it on graph paper to put it to scale. I'm currently trying to fix the CG. As for the wind... OK... in winter... hard to find a day without wind. Thank you for all the tips. @Hai-Lee, how hard would you suggest? @Arcfyre, don't feel comfortable sharing that. Thank you for your concerns though. @quorneng, currently, I have the wings out, so I can't get a true weight. All I know is that it probably weighs the same as an FT foam board design. And to all of you, most of you suggested picking a different design that a P-51. I plan on trying to fix the CG, and if that does not work, I will move on to more of a trainer. Even if the P-51 does work, I still plan on making a trainer afterward. what article would you suggest? I was referring to the manual that came with your plane. It should say where the CG should be. I’m assuming it is a store bought plane. @Arcfyre, don't feel comfortable sharing that. Thank you for your concerns though." Sorry if my first post in this thread came across as a little snippy. I hadn't eaten yet and it was a long day at work. I hope you feel as I do that you are surrounded by helpful, friendly people here that have your best interests at heart. I'm not sure why you wouldn't feel comfortable sharing a picture, but let me assure you that you can count on only constructive and well intentioned feedback from the members of this forum. That being said, a picture, or a series of pictures, can often be more helpful than a description when attempting to diagnose a problem. Something that may seem correct and normal to you may stand out immediately to an experienced builder. We are all here to help and all we want is for you to be successful. @Merv it was not a store-bought plane. It was designed and built by me, probably causing the problems since I am fairly new. @Arcfyre, no worries on the first thread. I do realize the love going around and that's exactly why I came to FT Forums. Unfortunately, I still do not feel comfortable sharing pictures, and even if I did, I don't know how I would get them uploaded. And why I do realize that pictures would help more, that's why I said feel free to ask questions. I am willing to answer most. Such as the planes dimensions, the battery, and electronics I would use, etc. The forum has a simple picture uploader, it does all the work for you. Don’t worry about how it looks, people here are very helpful and non judgemental, unlike some other places. If you copied the outline then likely you will have something that is not going to be super easy to put RC in, since servo mounts, a place for a battery and a hatch to get at the electrics weren’t in the original design! I would still suggest fully finishing mounting all the RC gear, motor and allow the battery to be mounted on a strip of velcro near the front so you can use it to tune the weight distribution BEFORE you worry about testing the flight characteristics. Put the rudder and elevator servos near the back of the wing with linkage going out the tail like the FT ones and the aileron servos in the front third of the wing near the spar. If it’s a smaller plane use lighter servos. You could temporarily stick the aileron servos without them being connected if you are worried about how to set them up. Think of the original airframe, I very much doubt they chucked them off a tower without an engine, controls or avionics in to see if it was going to fly. I suspect they made scale models first, just as you have done, then worked out the CG and where to put everything! Worst case scenario it proves impossible to balance etc then you have a nice scale model to practice painting on, then buy a speed build kit or print the plans for a kit of your choice, then go try that with RC in. Wow, I’m impressed, your first plane, a scratch build. I also prefer to build my own rather the store bought. The CG should be at 25-30% of the average wing cord. On a rectangular wing, that an easy calculation. With a tapper or swept wing it’s more difficult. I use a CAD program (Sketch Up) to model the wing. Draw a line at 25% of the wing area. Building a plane scaled up from a 3 view is interesting but just don't expect it to work first time. If you have built the wings of your P51 can you tell us the wing span? This would give an idea of its overall size and from that it would not be too hard to suggest a suitable motor, battery size and a 'target' weight. Weight is going to be a key factor. As a scratch build you want it to fly as slowly as possible simply to give yourself a bit more time to actually see what is happening and it will also crash that much slower as well. Perhaps one option is to test glide the bare air frame with nothing in it, just some nose weight. It obviously will be much lighter so will fly really slowly and hopefully not get damaged. You simply adjust the nose weight until it glides smoothly in more or less a straight line. This also has the advantage that it gives you a pretty good idea where it must balance when everything is installed. It even works if you build a simple smaller scale 'chuck' glider so you don't have to risk test gliding the bigger plane. My simple 1/2 size Concorde foam chuck glider I built to test glide to find its balance point. 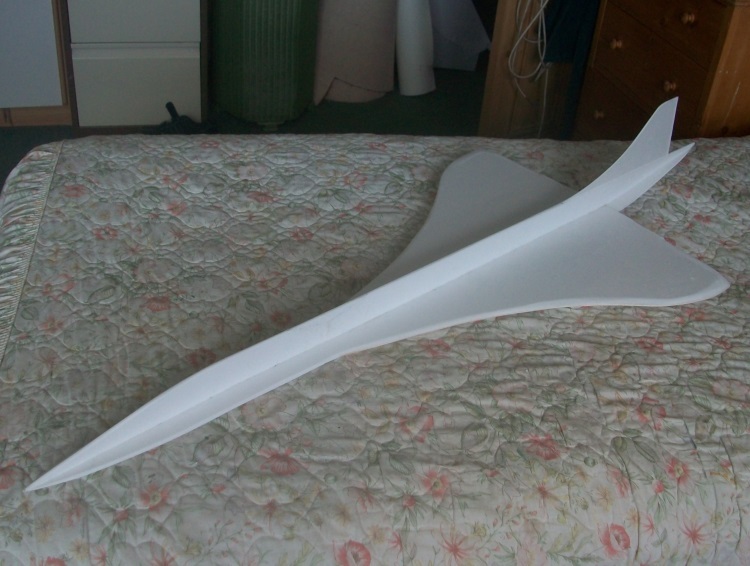 The final model, also built of foam (Depron), is true scale, nearly 9 feet long and powered by 4 EDFs so test gliding it to find out where it should balance was not really an option. Finally don't be shy about including pictures. We have all "been there and done that". Here is an article on Finding the Mean Aerodynamic Chord (MAC). Place you CG at 25% of the MAC, a fairly safe place to start. This will allow you to get the plane trimmed out to fly smoothly. Once trimmed, you may want to move the CG aft to suit your flying taste. @Merv I wish. It was my second scratch build. The first one was also an attempt at a P-51 and was also unsuccessful. Thanks for the website, that's exactly what I was looking for. @quorneng, it has a 20" span. I was going to use a C pack motor and 4 5g servos. And a 2s battery. pretty much everything from an A pack with the exception of the C pack motor. Right now I think I'm going to put the P-51 aside and work on my scratch built trainer I started yesterday. Hate to be a pessimist here, but the c-pack motor will not work with a 20 inch wingspan, it’s way to big, heavy, and has way to much torque for something this small. The smallest wingspan ft does with the c-pack is that bloody baron, which as a 30 inch span. I’d build bigger or get a smaller motor if I were you, good luck though 🙂. @Paracodespoder, no, please. That's why I'm here. To get your guys to view things. Thanks for the feedback! Your welcome, glad to help. I too have tried the c-pack on a 19 inch span plane, it didn’t work at all. Needless to say, the nutball is way overpowered with the c motor 😁. You need to work out your mass, lift etc then you can see how much thrust you need, there’s a lot of posts on how to do that. It’s one reason I have stuck to plans so far, I don’t know enough to get my components balanced and decent flight characteristics. Making the shapes is no problem, making the shape fly is a bit more complicated!